Me too ... I'm so sorry I don't understand the writings! The ones in the igloo are saying "winter time is cold indeed"
The one standing next to the snowman is saying "It looks just like me!" The one pulling the sleigh with Pooh is saying "Heaveeeey!" Thank you so very much for always taking your time to translate for us! Oh poor Shikigami chanz! They're crying their eyes out because they didn't receive DM from Lotte regarding their creative hot Ghana chocolate competition twitter posts to win Yuzu drink muddler/little spoon! The first one is about Yuzu arriving in PC airport and Haru chan from the future is asking him if he can see Haru chan. Haru chan is also telling Yuzu "Do you know? You're going to win consecutive OGM" and Yuzu replies "OFC I am only after gold"
Also he adds "And perhaps I think I know you as well"
The second picture is about AERA photo shoot. Ori chan said he's won paper rock scissors with Yuzu. Oto chan is covering Haru chan with blanket I love the artist's characterisation of Yuzu's programs! The third one is about Valentine's day. From right to left, Ballad no.1 muttering "It's definitely quality" LGC looking at Origin and declared "I've got more!". Origin is saying "It's not the quantity but the heart as mine is hand-made (though it's from Haru chan...)"
Otonal cannot take all in and don't know what to do. 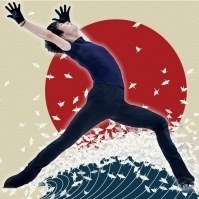 Swanyu is asking "Haru chan what are you doing?" H&L is looking at Haru chan muttering "Ah directly from the creator" and Haru chan is getting into the box saying "I'm going to Javi's and hand this to him"